The African Union (AU) is a continental union consisting of 55 member states located on the continent of Africa, with exception of various territories of European possessions located in Africa. The bloc was founded on 26 May 2001 in Addis Ababa, Ethiopia and launched on 9 July 2002 in South Africa. The intention of the AU is to replace the Organisation of African Unity (OAU), established on 25 May 1963 in Addis Ababa by 32 signatory governments. The most important decisions of the AU are made by the Assembly of the African Union, a semi-annual meeting of the heads of state and government of its member states. The AU's secretariat, the African Union Commission, is based in Addis Ababa. The African Union has an area of around 29 million km2 (11 million sq mi) and includes popular world landmarks, including the Sahara and the Nile. The primary languages spoken include Arabic, English, French and Portuguese and the languages of Africa. Within the African Union, there are official bodies such as the Peace and Security Council and the Pan-African Parliament. "A United and Strong Africa"
"Let Us All Unite and Celebrate Together"
"and African languages if possible"
a Seat of the African Union Commission. b Seat of the Pan-African Parliament. To achieve greater unity, cohesion and solidarity between the African countries and African nations. To defend the sovereignty, territorial integrity and independence of its Member States. To accelerate the political and social-economic integration of the continent. To promote and defend African common positions on issues of interest to the continent and its peoples. To encourage international cooperation, taking due account of the Charter of the United Nations and the Universal Declaration of Human Rights. To promote peace, security, and stability on the continent. To promote democratic principles and institutions, popular participation and good governance. To promote and protect human and peoples' rights in accordance with the African Charter on Human and Peoples' Rights and other relevant human rights instruments. To establish the necessary conditions which enable the continent to play its rightful role in the global economy and in international negotiations. To promote sustainable development at the economic, social and cultural levels as well as the integration of African economies. To promote co-operation in all fields of human activity to raise the living standards of African peoples. To coordinate and harmonise the policies between the existing and future Regional Economic Communities for the gradual attainment of the objectives of the Union. To advance the development of the continent by promoting research in all fields, in particular in science and technology. To work with relevant international partners in the eradication of preventable diseases and the promotion of good health on the continent. The African Union is made up of both political and administrative bodies. The highest decision-making organ is the Assembly of the African Union, made up of all the heads of state or government of member states of the AU. The Assembly is chaired by Abdel Fattah el-Sisi, President of Egypt. The AU also has a representative body, the Pan African Parliament, which consists of 265 members elected by the national legislatures of the AU member states. Its president is Roger Nkodo Dang. the Economic, Social, and Cultural Council (ECOSOCC), a civil society consultative body. The AU Commission, the secretariat to the political structures, is chaired by Nkosazana Dlamini-Zuma of South Africa. On 15 July 2012, Ms. Dlamini-Zuma won a tightly contested vote to become the first female head of the African Union Commission, replacing Jean Ping of Gabon. the New Partnership for Africa's Development (NEPAD) and APRM Secretariats and the Pan-African Parliament are in Midrand, South Africa. The AU's first military intervention in a member state was the May 2003 deployment of a peacekeeping force of soldiers from South Africa, Ethiopia, and Mozambique to Burundi to oversee the implementation of the various agreements. AU troops were also deployed in Sudan for peacekeeping during Darfur conflict, before the mission was handed over to the United Nations on 1 January 2008 UNAMID. The AU has also sent a peacekeeping mission to Somalia, of which the peacekeeping troops are from Uganda and Burundi. The AU has adopted a number of important new documents establishing norms at continental level, to supplement those already in force when it was created. These include the African Union Convention on Preventing and Combating Corruption (2003), the African Charter on Democracy, Elections and Governance (2007), the New Partnership for Africa's Development (NEPAD) and its associated Declaration on Democracy, Political, Economic and Corporate Governance. The historical foundations of the African Union originated in the First Congress of Independence African States, held in Accra, Ghana, from 15 to 22 April 1958. The conference aimed at forming the Africa Day, to mark the liberation movement each year concerning the willingness of the African people to free themselves from foreign dictatorship, as well as subsequent attempts to unite Africa, including the Organisation of African Unity (OAU), which was established on 25 May 1963, and the African Economic Community in 1981. Critics argued that the OAU in particular did little to protect the rights and liberties of African citizens from their own political leaders, often dubbing it the "Dictators' Club". The idea of creating the AU was revived in the mid-1990s under the leadership of Libyan head of state Muammar al-Gaddafi: the heads of state and government of the OAU issued the Sirte Declaration (named after Sirte, in Libya) on 9 September 1999, calling for the establishment of an African Union. The Declaration was followed by summits at Lomé in 2000, when the Constitutive Act of the African Union was adopted, and at Lusaka in 2001, when the plan for the implementation of the African Union was adopted. During the same period, the initiative for the establishment of the New Partnership for Africa's Development (NEPAD), was also established. The African Union was launched in Durban on 9 July 2002, by its first chairperson, South African Thabo Mbeki, at the first session of the Assembly of the African Union. The second session of the Assembly was in Maputo in 2003, and the third session in Addis Ababa on 6 July 2004. Since 2010, the African Union eyes the establishment of a joint African space agency. Barack Obama was the first ever sitting United States president to speak in front of the African Union in Addis Ababa, on 29 July 2015. With his speech, he encouraged the world to increase economic ties via investments and trade with the continent, and lauded the progresses made in education, infrastructure and economy. But he also criticised a lack of democracy and leaders who refuse to step down, discrimination against minorities (including LGBT people, religious groups and ethnicities) and corruption. He suggested an intensified democratisation and free trade, to significantly increase living quality for Africans. Member states of the African Union cover almost the entirety of continental Africa, except for several territories held by Spain (Canary Islands, Plazas de soberanía); France (Mayotte, Réunion, Scattered Islands in the Indian Ocean); Portugal (Madeira, Savage Islands); and the United Kingdom (Saint Helena, Ascension and Tristan da Cunha). Consequently, the geography of the African Union is wildly diverse, including the world's largest hot desert (the Sahara), huge jungles and savannas, and the world's longest river (the Nile). The AU presently has an area of 29,922,059 square kilometres (11,552,972 sq mi), with 24,165 kilometres (15,015 mi) of coastline. The vast majority of this area is on continental Africa, while the only significant territory off the mainland is the island of Madagascar (the world's fourth largest island), accounting for slightly less than 2% of the total. According to the Constitutive Act of the African Union, its working languages are Arabic, English, French and Portuguese, and African languages "if possible". A protocol amending the Constitutive Act, adopted in 2003 but as of June 2016 not yet ratified by a two-thirds majority of member states, would add Spanish, Swahili and "any other African language" and declare all "official" (rather than "working") languages of the African Union. The Executive Council shall determine the process and practical modalities for the use of official languages as working languages. Founded in 2001 under the auspices of the AU, the African Academy of Languages promotes the usage and perpetuation of African languages among African people. The AU declared 2006 the Year of African Languages. 2006 also marked Ghana's 55th anniversary since it founded the Bureau of Ghana Languages originally known as Gold Coast Vernacular Literature Bureau. To become the highest legislative body of the African Union. The seat of the PAP is at Midrand, South Africa. The Parliament is composed of 265 elected representatives from all 55 AU states, and intended to provide popular and civil-society participation in the processes of democratic governance. Its president is Roger Nkodo Dang, of Cameroon. Composed of heads of state and heads of government of AU states, the Assembly is currently the supreme governing body of the African Union. It is gradually devolving some of its decision-making powers to the Pan African Parliament. It meets once a year and makes its decisions by consensus or by a two-thirds majority. The current chair of the AU is Egyptian President Abdel Fattah el-Sisi. The secretariat of the African Union, composed of ten commissioners and supporting staff and headquartered in Addis Ababa, Ethiopia. In a similar fashion to its European counterpart, the European Commission, it is responsible for the administration and co-ordination of the AU's activities and meetings. The Constitutive Act provides for a Court of Justice to rule on disputes over interpretation of AU treaties. A protocol to set up this Court of Justice was adopted in 2003 and entered into force in 2009. It was, however, superseded by a protocol creating an African Court of Justice and Human Rights, which will incorporate the already established African Court on Human and Peoples' Rights (see below) and have two chambers: one for general legal matters and one for rulings on the human rights treaties. Composed of ministers designated by the governments of member states. It decides on matters such as foreign trade, social security, food, agriculture and communications, is accountable to the Assembly, and prepares material for the Assembly to discuss and approve.It is chaired by Mr Shawn Makuyana of Zimbabwe (2015–). Consisting of nominated permanent representatives of member states, the Committee prepares the work for the Executive Council, similar the role of the Committee of Permanent Representatives in the European Union. Proposed at the Lusaka Summit in 2001 and established in 2004 under a protocol to the Constitutive Act adopted by the AU Assembly in July 2002. The protocol defines the PSC as a collective security and early warning arrangement to facilitate timely and effective response to conflict and crisis situations in Africa. Other responsibilities conferred to the PSC by the protocol include prevention, management and resolution of conflicts, post-conflict peace building and developing common defence policies. The PSC has fifteen members elected on a regional basis by the Assembly. Similar in intent and operation to the United Nations Security Council. An advisory organ composed of professional and civic representatives, similar to the European Economic and Social Committee. The chair of ECOSOCC, elected in 2008, is Cameroonian lawyer Akere Muna of the Pan-African Lawyers Union (PALU). Both the Abuja Treaty and the Constitutive Act provide for Specialised Technical Committees to be established made up of African ministers to advise the Assembly. In practice, they have never been set up. The ten proposed themes are: Rural Economy and Agricultural Matters; Monetary and Financial Affairs; Trade, Customs, and Immigration; Industry, Science and Technology; Energy, Natural Resources, and Environment; Transport, Communications, and Tourism; Health; Labour, and Social Affairs; Education, Culture, and Human Resources. These institutions have not yet been established, however, the Steering Committees working on their founding have been constituted. Eventually, the AU aims to have a single currency (the Afro). The African Commission on Human and Peoples' Rights, in existence since 1986, is established under the African Charter on Human and Peoples' Rights (the African Charter) rather than the Constitutive Act of the African Union. It is the premier African human rights body, with responsibility for monitoring and promoting compliance with the African Charter. The African Court on Human and Peoples' Rights was established in 2006 to supplement the work of the Commission, following the entry into force of a protocol to the African Charter providing for its creation. It is planned that the African Court on Human and Peoples' Rights will be merged with the Court of Justice of the African Union (see above). All UN member states based in Africa and on African waters are members of the AU, as is the disputed Sahrawi Arab Democratic Republic (SADR). Morocco, which claims sovereignty over the SADR's territory, withdrew from the Organisation of African Unity, the AU's predecessor, in 1984 due to the admission of the SADR as a member. However, on 30 January 2017, the AU admitted Morocco as a member state. The principal topic for debate at the July 2007 AU summit held in Accra, Ghana, was the creation of a Union Government, with the aim of moving towards a United States of Africa. A study on the Union Government was adopted in late 2006, and proposes various options for "completing" the African Union project. There are divisions among African states on the proposals, with some (notably Libya) following a maximalist view leading to a common government with an AU army; and others (especially the southern African states) supporting rather a strengthening of the existing structures, with some reforms to deal with administrative and political challenges in making the AU Commission and other bodies truly effective. Conduct an audit of the institutions and organs of the AU; review the relationship between the AU and the RECs; find ways to strengthen the AU and elaborate a timeframe to establish a Union Government of Africa. The declaration lastly noted the "importance of involving the African peoples, including Africans in the Diaspora, in the processes leading to the formation of the Union Government." Following this decision, a panel of eminent persons was set up to conduct the "audit review". The review team began its work on 1 September 2007. The review was presented to the Assembly of Heads of State and Government at the January 2008 summit in Addis Ababa. No final decision was taken on the recommendations, however, and a committee of ten heads of state was appointed to consider the review and report back to the July 2008 summit to be held in Egypt. At the July 2008 summit, a decision was once again deferred, for a "final" debate at the January 2009 summit to be held in Addis Ababa. One of the key debates in relation to the achievement of greater continental integration is the relative priority that should be given to integration of the continent as a unit in itself or to integration of the sub-regions. The 1980 Lagos Plan of Action for the Development of Africa and the 1991 treaty to establish the African Economic Community (also referred to as the Abuja Treaty), proposed the creation of Regional Economic Communities (RECs) as the basis for African integration, with a timetable for regional and then continental integration to follow. The membership of many of the communities overlaps, and their rationalisation has been under discussion for several years – and formed the theme of the 2006 Banjul summit. At the July 2007 Accra summit the Assembly finally decided to adopt a Protocol on Relations between the African Union and the Regional Economic Communities. This protocol is intended to facilitate the harmonisation of policies and ensure compliance with the Abuja Treaty and Lagos Plan of Action time frames. In 2006, the AU decided to create a Committee "to consider the implementation of a rotation system between the regions" in relation to the presidency. Controversy arose at the 2006 summit when Sudan announced its candidacy for the AU's chairmanship, as a representative of the East African region. Several member states refused to support Sudan because of tensions over Darfur (see also below). Sudan ultimately withdrew its candidacy and President Denis Sassou-Nguesso of the Republic of the Congo was elected to a one-year term. At the January 2007 summit, Sassou-Nguesso was replaced by President John Agyekum Kufuor of Ghana, despite another attempt by Sudan to gain the chair. 2007 was the 50th anniversary of Ghana's independence, a symbolic moment for the country to hold the chair of the AU—and to host the mid-year summit at which the proposed Union Government was also discussed. In January 2008, President Jakaya Kikwete of Tanzania took over as chair, representing the East African region and thus apparently ending Sudan's attempt to become chair—at least till the rotation returns to East Africa. The current chair is Egypt. The main administrative capital of the African Union is in Addis Ababa, Ethiopia, where the African Union Commission is headquartered. A new headquarters complex, the AU Conference Center and Office Complex (AUCC), was inaugurated on 28 January 2012, during the 18th AU summit. The complex was built by China State Construction Engineering Corporation as a gift from the Chinese government, and accommodates, among other facilities, a 2,500-seat plenary hall and a 20-story office tower. The tower is 99.9 meters high to signify the date 9 September 1999, when the Organisation of African Unity voted to become the African Union. The building cost US$200 million to construct. On 26 January 2018, five years after the building's completion, the French Newspaper Le Monde published an article stating that the Chinese government had heavily bugged the building, installing listening devices in the walls and furniture and setting up the computer system to copy data to servers in Shanghai daily. The Chinese government denied that they bugged the building, stating that the accusations were "utterly groundless and ridiculous." Ethiopian Prime Minister Hailemariam Desalegn rejected the French media report. Moussa Faki Mahamat, head of the African Union Commission, said the allegations in the Le Monde's report were false. "These are totally false allegations and I believe that we are completely disregarding them." ICC – Extraordinary Summit Ethiopia Addis Ababa 11–12 October 2013 “Africa's relationship with the ICC” This was in regards to the ICC's non-adherence to AU calls to drop certain charges against sitting leaders and that it was disproportionally targeting Africans. 1st South Africa Durban 28–10 July 2002 “Peace, Development and Prosperity: The African Century” Notable events include the launch of the African Union. The individual member states of the African Union coordinate foreign policy through this agency, in addition to conducting their own international relations on a state-by-state basis. The AU represents the interests of African peoples at large in intergovernmental organisations (IGOs); for instance, it is a permanent observer at the United Nations General Assembly. Both the African Union and the United Nations work in tandem to address issues of common concerns in various areas. The African Union Mission in United Nations aspires to serve as a bridge between the two Organisations. Membership of the AU overlaps with other IGOs and occasionally these third-party organisations and the AU will coordinate matters of public policy. The African Union maintains special diplomatic representation with the United States and the European Union. In 2016, the Union introduced continent-wide passports. Upon the election of Donald Trump for the presidency of the U.S., in 2017, the latter passed an executive order for a ban on citizens from seven countries with suspected links to terrorism, that concerns three African countries. During the 28th African Union Summit, in Ethiopia, African leaders criticised the ban as they expressed their growing concerns for the African Economy, under Trump's policies. One of the leading economic partners of the continent has been the People's Republic of China (PRC). In September 2018, the bloc held its third Forum on China–Africa Cooperation summit in Beijing, China. The AU's future goals include the creation of a free trade area, a customs union, a single market, a central bank, and a common currency (see African Monetary Union), thereby establishing economic and monetary union. The current plan is to establish an African Economic Community with a single currency by 2023. The following table shows various data for AU member states, including area, population, economic output and income inequality, as well as various indices, including human development, viability of the state, perception of corruption, economic freedom, state of peace, freedom of the press and democratic level. a External data from 2016. b External data from 2015. c External data from 2014. d AU total used for indicators 1 through 3; AU weighted average used for indicator 4; AU unweighted average used for indicators 5 through 12. 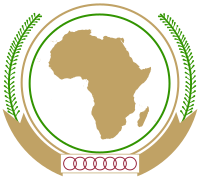 The emblem of the African Union consists of a gold ribbon bearing small interlocking red rings, from which palm leaves shoot up around an outer gold circle and an inner green circle, within which is a gold representation of Africa. The red interlinked rings stand for African solidarity and the blood shed for the liberation of Africa; the palm leaves for peace; the gold, for Africa's wealth and bright future; the green, for African hopes and aspirations. To symbolise African unity, the silhouette of Africa is drawn without internal borders. The African Union adopted its new flag at its 14th Ordinary Session of the Assembly of Heads of State and Government taking place in Addis Ababa 2010. During the 8th African Union Summit which took place in Addis Ababa on 29 and 30 January 2007, the Heads of State and Government decided to launch a competition for the selection of a new flag for the Union. They prescribed a green background for the flag symbolising hope of Africa and stars to represent Member States. Pursuant to this decision, the African Union Commission (AUC) organised a competition for the selection of a new flag for the African Union. The AUC received a total of 106 entries proposed by citizens of 19 African countries and 2 from the Diaspora. The proposals were then examined by a panel of experts put in place by the African Union Commission and selected from the five African regions for short listing according to the main directions given by the Heads of State and Government. At the 13th Ordinary Session of the Assembly, the Heads of State and Government examined the report of the Panel and selected one among all the proposals. The flag is now part of the paraphernalia of the African Union and replaces the old one. The old flag of the African Union bears a broad green horizontal stripe, a narrow band of gold, the emblem of the African Union at the centre of a broad white stripe, another narrow gold band and a final broad green stripe. Again, the green and gold symbolise Africa's hopes and aspirations as well as its wealth and bright future, and the white represents the purity of Africa's desire for friends throughout the world. The flag has led to the creation of the "national colours" of Africa of gold and green (sometimes together with white). These colours are visible in one way or another in the flags of many African nations. Together the colours green, gold, and red constitute the Pan-African colours. The African Union has adopted the anthem, "Let Us All Unite and Celebrate Together". The Fez Festival of World Sacred Music: a week long celebration for harmony between cultures with dancing, Moroccan music, art exhibitions and films. The Knysna Oyster festival: held in Knysna and focused around sport, food and their oyster heritage. Lake of Stars Festival: three-day celebration that takes place in Lake Malawi, showcasing African music and welcoming people from around the world. Fête du Vodoun: also known as the Ouidah Voodoo Festival. It is centred around their rituals on voodoo temples, with entertainment that includes horse races and traditional drum performances. Umhlanga (ceremony): is mainly a private event for young women but on the sixth and seventh days the traditions are done publicly. Marsabit Lake Turkana Cultural Festival: held in Kenya and celebrates harmony amongst tribes with their culture, singing, dancing and traditional costumes. The AU faces many challenges, including health issues such as combating malaria and the AIDS/HIV epidemic; political issues such as confronting undemocratic regimes and mediating in the many civil wars; economic issues such as improving the standard of living of millions of impoverished, uneducated Africans; ecological issues such as dealing with recurring famines, desertification, and lack of ecological sustainability; as well as the legal issues regarding Western Sahara. The AU has been active in addressing the AIDS pandemic in Africa. In 2001, the AU established AIDS Watch Africa to coordinate and mobilise a continent-wide response. Sub-Saharan Africa, especially southern and eastern Africa, is the most affected area in the world. Though this region is home to only 6.2% of the world's population, it is also home to half of the world's population infected with HIV. While the measurement of HIV prevalence rates has proved methodologically challenging, more than 20% of the sexually active population of many countries of southern Africa may be infected, with South Africa, Botswana, Kenya, Namibia, and Zimbabwe all expected to have a decrease in life expectancy by an average of 6.5 years. The pandemic has had massive implications for the economy of the continent, reducing economic growth rates by 2–4% across Africa. In July 2007, the AU endorsed two new initiatives to combat the AIDS crisis, including a push to recruit, train and integrate 2 million community health workers into the continent's healthcare systems. In January 2012, the African Union Assembly requested that the African Union Commission would work out “a roadmap of shared responsibility to draw on African efforts for a viable health funding with support of traditional and emerging partners to address AIDS dependency response.” Once created, the roadmap (as it is officially known) provided a group of solutions that would enhance the shared responsibility and global solidarity for AIDS, TB, and Malaria responses in Africa by 2015. The roadmap was organised into three pillars which were: diversified financing, access to medicines, and enhanced health governance. The roadmap held stakeholders accountable for the realisation of these solutions between 2012 and 2015. The first pillar, diversified financing, ensures that countries begin to develop a country specific financial sustainability plans with clear targets, and identify and maximise opportunities to diversify funding sources in order to increase the domestic resource allocation to AIDS and other diseases. The second pillar, access to affordable and quality-assured medicines, tries to promote and facilitate investing in leading medicine hub manufacturers in Africa, accelerate and strengthen medicine regulatory harmonisation, and create legislation that would help to protect the knowledge of the researchers who develop these life-saving medicines. The third pillar, enhanced leadership and governance, tries to invest in programs that support people and communities to prevent HIV and ensure that leadership at all levels is mobilised to implement the roadmap. There are several organisations that will ensure the smooth implementation of the roadmap, including NEPAD, UNAIDS, WHO, and several other UN partners. Daniel Batidam, an anti-corruption advisory board member of the African Union, resigned after stating that the organisation had "multiple irregularities" and that "issues have come up over and over again" regarding corruption. The African Union quickly accepted his resignation, with Batidam saying that it was a sign that mismanagement towards corruption will "continue with business as usual". When the conflicts in Libya began in 2011, the African Union was initially criticised for not doing much to prevent the escalation of conflict in Libya. Additionally, the AU hesitated to take a side when the conflict in Libya began. There was some vagueness when it came to the African Union's position in the conflict, it was unclear if they were fully supporting the Libyan regime or if they were instead supporting the Libyan citizens. This ambiguity occurred right around the time when there were several human right violations against the Libyan regime. It was later realised that the hesitation in the AU's response to the Arab Spring in Libya was due to its lack of capacity and capability for engaging in democratic reforms. The AU attempted to mediate in the early stages of the 2011 Libyan civil war, forming an ad hoc committee of five presidents (Congolese President Denis Sassou Nguesso, Malian President Amadou Toumani Touré, Mauritanian President Mohamed Ould Abdel Aziz, South African President Jacob Zuma, and Ugandan President Yoweri Museveni) to broker a truce. However, the beginning of the NATO-led military intervention in March 2011 prevented the committee from traveling to Libya to meet with Libyan leader and former head of the AU until 2010 Muammar Gaddafi. As a body, the AU sharply dissented from the United Nations Security Council's decision to create a no-fly zone over Libya, though a few member states, such as Botswana, Gabon, Zambia, and others expressed support for the resolution. As a result of Gaddafi's defeat at the Battle of Tripoli, the decisive battle of the war, in August 2011, the Arab League voted to recognise the anti-Gaddafi National Transitional Council as the legitimate government of the country pending elections, yet although the council has been recognised by several AU member states, including two countries that are also members of the Arab League, the AU Peace and Security Council voted on 26 August 2011 not to recognise it, insisting that a ceasefire be agreed to and a national unity government be formed by both sides in the civil war. A number of AU member states led by Ethiopia, Nigeria, and Rwanda requested that the AU recognise the NTC as Libya's interim governing authority, and several other AU member states have recognised the NTC regardless of the Peace and Security Council's decision. However, AU member states Algeria and Zimbabwe have indicated they will not recognise the NTC, and South Africa has expressed reservations as well. On 20 September 2011, the African Union officially recognised the National Transitional Council as the legitimate representative of Libya. In post-Gaddafi Libya, the African Union believes it still has an important responsibility to the country despite its failure to contribute to the conflict when it originated. The AU is essentially fighting an uphill battle though because of their failure to support the Libyan rebels. Although the African Union is there to keep peace, it is not a long term solution. The goal, as stated by the AU, is to establish a Libyan government that is sustainable to ensuring the peace in Libya. To achieve some level of peace in Libya, the AU has to moderate peace talks which are aimed at achieving compromises and power sharing accommodations as well. In response to the death of Gnassingbé Eyadéma, President of Togo, on 5 February 2005, AU leaders described the naming of his son Faure Gnassingbé the successor as a military coup. Togo's constitution calls for the speaker of parliament to succeed the president in the event of his death. By law, the parliament speaker must call national elections to choose a new president within sixty days. The AU's protest forced Gnassingbé to hold elections. Under heavy allegations of election fraud, he was officially elected President on 4 May 2005. The Malian army was formed on 1 October 1960 and was supported by the Soviet Union. In March 2012, a military coup was staged in Mali, when an alliance of Touareg and Islamist forces conquered the north, resulting in a coming to power of the Islamists. This resulted in the deaths of hundreds of Malian soldiers and the loss of control over their camps and positions. After a military intervention with help from French troops, the region was in control of the Malian army. To reinstall local authorities, the AU helped to form a caretaker government, supporting it and holding presidential elections in Mali in July 2013. In 2013, a summit for the African Union was held and it was decided that the African Union was going to enlarge their military presence in Mali. The AU decided to do this because of increasing tensions between al-Qaeda forces and the Mali army. There have been several rebel groups that are vying for control of parts of Mali. These rebel groups include the National Movement for the Liberation of Azawad (MNLA), the National Front for the Liberation of Azawad (FLNA), Ganda Koy, Ganda Izo, Ansar ad-Din, and Al-Qaeda in the Islamic Maghreb (AQIM). AU forces have been tasked with counterinsurgency missions in Mali as well as governing presidential elections to ensure as smooth a transition of power as possible. One of the objectives of the AU is to "promote peace, security, and stability on the continent". Among its principles is "Peaceful resolution of conflicts among Member States of the Union through such appropriate means as may be decided upon by the Assembly". The primary body charged with implementing these objectives and principles is the Peace and Security Council. The PSC has the power, among other things, to authorise peace support missions, to impose sanctions in case of unconstitutional change of government, and to "take initiatives and action it deems appropriate" in response to potential or actual conflicts. The PSC is a decision-making body in its own right, and its decisions are binding on member states. Article 4(h) of the Constitutive Act, repeated in article 4 of the Protocol to the Constitutive Act on the PSC, also recognises the right of the Union to intervene in member state in circumstances of war crimes, genocide and crimes against humanity. Any decision to intervene in a member state under article 4 of the Constitutive Act will be made by the Assembly on the recommendation of the PSC. Since it first met in 2004, the PSC has been active in relation to the crises in Darfur, Comoros, Somalia, Democratic Republic of Congo, Burundi, Côte d'Ivoire and other countries. It has adopted resolutions creating the AU peacekeeping operations in Somalia and Darfur, and imposing sanctions against persons undermining peace and security (such as travel bans and asset freezes against the leaders of the rebellion in Comoros). The Council is in the process of overseeing the establishment of a "standby force" to serve as a permanent African peacekeeping force. Institute for Security Studies, South Africa, March 2008. The founding treaty of the AU also called for the establishment of the African Peace and Security Architecture (APSA), including the African Standby Force (ASF), which is to be deployed in emergencies. That means, in cases of genocide or other serious human-rights violations, an ASF mission can be launched even against the wishes of the government of the country concerned, as long as it is approved by the AU General Assembly. In the past AU peacekeeping missions, the concept was not yet applied, forces had to be mobilised from member states. The AU is planning on putting the concept into practise by 2015 at the earliest. In response to the ongoing Darfur conflict in Sudan, the AU has deployed 7,000 peacekeepers, many from Rwanda and Nigeria, to Darfur. While a donor's conference in Addis Ababa in 2005 helped raise funds to sustain the peacekeepers through that year and into 2006, in July 2006 the AU said it would pull out at the end of September when its mandate expires. Critics of the AU peacekeepers, including Dr. Eric Reeves, have said these forces are largely ineffective due to lack of funds, personnel, and expertise. Monitoring an area roughly the size of France has made it even more difficult to sustain an effective mission. In June 2006, the United States Congress appropriated US$173 million for the AU force. Some, such as the Genocide Intervention Network, have called for UN or NATO intervention to augment and/or replace the AU peacekeepers. The UN has considered deploying a force, though it would not likely enter the country until at least October 2007. The under-funded and badly equipped AU mission was set to expire on 31 December 2006 but was extended to 30 June 2007 and merged with the United Nations African Union Mission in Darfur in October 2007. In July 2009 the African Union ceased cooperation with the International Criminal Court, refusing to recognise the international arrest warrant it had issued against Sudan's leader, Omar al-Bashir, who was indicted in 2008 for war crimes. The AU struggled to have a strategic role in the independence talks and the reconciliation process of South Sudan, anyway due to overwhelming interests of African and non-African powers, its influence is still limited and not consistent. From the early 1990s up until 2000, Somalia was without a functioning central government. A peace agreement aimed at ending the civil war that broke out following the collapse of the Siad Barre regime was signed in 2006 after many years of peace talks. However, the new government was almost immediately threatened by further violence. In February 2007, the African Union (AU) and European Union (EU) worked together to establish the African Union Mission in Somalia (AMISOM). The purpose of AMISOM was to create a foundation that would hopefully provide aid to some of Somalia's most vulnerable and keep the peace in the region. They are tasked with everything from protecting federal institutions to facilitating humanitarian relief operations. Much of the AU's opposition comes from an Islamic extremist group named al-Shabaab. To temporarily shore up the government's military base, starting in March 2007, AU soldiers began arriving in Mogadishu as part of a peacekeeping force that was intended by the AU to eventually be 8,000 strong. Eritrea recalled its ambassadors to the African Union on 20 November 2009 after the African Union called on the United Nations Security Council to impose sanctions on them due to their alleged support of Somali Islamists attempting to topple the Transitional Federal Government of Somalia, the internationally recognised government of Somalia which holds Somalia's seat on the African Union. On 22 December 2009, the United Nations Security Council passed UNSCR 1907, which imposed an arms embargo on Eritrea, travel bans on Eritrean leaders, and asset freezes on Eritrean officials. Eritrea strongly criticised the resolution. In January 2011, Eritrea reestablished their mission to the AU in Addis Ababa. In the fall of 2011, AMISOM forces, along with Kenyan and Ethiopian forces launched a set of offensive attacks on the al-Shabaab. In these attacks, AMISOM forces were able to reclaim key cities including the Somali capital of Mogadishu. In September 2013, Ethan Bueno de Mesquita, a political scientist, argued that with the help of AMISOM forces, they had made it “nearly impossible for al-Shabaab to hold territory even in its former strongholds in southern Somalia”. Although lots of progress has been made towards peace in the region, it should still be noted that African Union forces’ still get attacked regularly. Despite AMISOM being effective, it is vastly underfunded and many forces lack the resources required. Funding for humanitarian relief and the formation of armies tends to be vastly undercut. A successful 2008 invasion of Anjouan by AU and Comoros forces to stop self-declared president Mohamed Bacar, whose 2007 re-election was declared illegal. Prior to the invasion, France helped transport Tanzanian troops but their position in the disagreement was questioned when a French police helicopter was suspected of attempting to sneak Bacar into French exile. The first wave of troops landed on Anjouan Bay on 25 March and soon took over the airfield in Ouani, ultimately aiming to locate and remove Bacar from office. On the same day, the airport, capital, and second city were overrun and the presidential palace was deserted. Bacar escaped and sought asylum in France and the government of Comoros demanded they return him so they may determine his consequence. Many of Bacar's primary supporters were arrested by the end of March, including Caabi El-Yachroutu Mohamed and Ibrahim Halidi. His asylum request was rejected in 15 May as France agreed to cooperate with the Comoran governments demand. His presidential position was then occupied by Moussa Toybou after winning the election in 29 June. ^ "African Union anthem, etc". Africamasterweb.com. Archived from the original on 15 September 2015. Retrieved 26 November 2012. ^ "African Union votes to readmit Morocco". 19 September 2018 – via www.bbc.com. ^ Corresponds to the terrestrial surface. Including the Exclusive Economic Zones of each member state, the total area is 43 434 569 km². ^ Thabo Mbeki (9 July 2002). "Launch of the African Union, 9 July 2002: Address by the chairperson of the AU, President Thabo Mbeki". ABSA Stadium, Durban, South Africa: africa-union.org. Archived from the original on 3 May 2009. Retrieved 8 February 2009. ^ Manboah-Rockson, Joseph (23 September 2016). Politics & the Struggle for Democracy in Ghana: An Introduction to Political Science. ^  SAHO May 15th 2018. ^ African Union replaces dictators' club, BBC, 8 July 2002. ^ "Africa eyes joint space agency". Phys.org. 11 September 2012. Retrieved 21 October 2013. ^ Lee, Carol E. "Obama Becomes First U.S. President to Address African Union". Wall Street Journal. Retrieved 29 July 2015. ^ "Remarks by President Obama to the People of Africa". The White House. Retrieved 29 July 2015. ^ Article 25, Constitutive Act of the African Union. ^ "Protocol on the Amendments to the Constitutive Act of the African Union | African Union". www.au.int. Retrieved 20 February 2018. ^ "Ethiopia: AU Launches 2006 As Year of African Languages". AllAfrica.com. 21 June 2006. Retrieved 30 October 2016. ^ Project for the Study of Alternative Education in South Africa (2006). "The Year of African Languages (2006) – Plan for the year of African Languages – Executive Summary". Project for the Study of Alternative Education in South Africa. Archived from the original on 23 September 2006. Retrieved 30 September 2006. ^ "Morocco rejoins African Union". Worldbulletin. 30 January 2017. Retrieved 31 January 2017. ^ Decision on the Report of the 9th Extraordinary session of the executive council on the proposals for the Union Government, DOC.Assembly/AU/10 (VIII), Assembly/AU/Dec.156 (VIII). ^ Study on an African Union Government: Towards a United States of Africa, 2006. See also, Decision on the Union Government, Doc. Assembly/AU/2(VII). ^ Accra Declaration, Assembly of the Union at its 9th Ordinary session in Accra, Ghana, 1–3 July 2007. ^ "Decision on the Report of the Executive Council on the Audit of the Union and the Report of the Ministerial Committee on the Union Government, Doc. Assembly/Au/8(X)" (PDF). Archived from the original (PDF) on 22 February 2012. Retrieved 26 November 2012. ^ See note on The Role of the Regional Economic Communities (RECs) as the Building Blocks of the African Union prepared by the South African Department of Foreign Affairs. ^ Decision on the Protocol on Relations between the African Union and the Regional Economic Communities (RECs), Assembly/AU/Dec.166 (IX). ^ See Towards a People-Driven African Union: Current Obstacles and New Opportunities Archived 16 February 2008 at the Wayback Machine, AfriMAP, AFRODAD and Oxfam GB, Updated Edition November 2007, pp. 45–46, and Strengthening Popular Participation in the African Union: A Guide to AU Structures and Processes Archived 27 September 2013 at the Wayback Machine, AfriMAP and Oxfam GB, 2010, pp. 8–9. ^ According to the AU Archived 6 October 2011 at the Wayback Machine, his official style is Son Excellence Obiang Nguema Mbasogo, Président de la République, Chef de l'État et Président Fondateur du Parti Démocratique de Guinée Equatoriale (in French). Retrieved 4 October 2011. ^ "President Paul Kagame, Elected as New Chairperson of the African Union for the year 2018 - African Union". au.int. ^ Press release No 13 / 18th AU Summit : Inauguration of the new African Union Conference Center Archived 16 February 2012 at the Wayback Machine. Directorate of Information and Communication. African Union Commission (28 January 2012). ^ Linyan, Wang. "New headquarters shows partnership entering era of hope: Ethiopia PM". China Daily. Retrieved 2 February 2012. ^ a b c Diplomat, Shannon Tiezzi, The. "If China Bugged the AU Headquarters, What African Countries Should Be Worried?". The Diplomat. Retrieved 4 February 2018. ^ "A Addis-Abeba, le siège de l'Union africaine espionné par Pékin". Le Monde.fr (in French). Retrieved 4 February 2018. ^ "AU spying report absurd: China". enca.com. Retrieved 21 March 2018. ^ "African Union says has no secret dossiers after China spying report". reuter.com. Retrieved 21 March 2018. ^ "30th AU summit". Retrieved 21 March 2018. ^ "29th AU summit". 5 July 2017. Retrieved 15 November 2017. ^ "28th AU summit". 30 January 2017. Retrieved 31 January 2017. ^ "27th AU summit". July 2016. Retrieved 29 September 2016. ^ "26th AU summit". January 2016. Retrieved 29 September 2016. ^ "25th AU summit". June 2015. Retrieved 29 September 2016. ^ "25th African Union Summit in Johannesburg – African Union Commission media information". June 2015. Retrieved 29 September 2016. ^ "A Call for Global Support in Ending Women's Violence Done by Angelina Jolie". newswatchngr.com. Newwatch NGR. February 2016. Retrieved 23 February 2016. ^ "24th AU summit". January 2015. Archived from the original on 24 June 2015. Retrieved 29 September 2016. ^ "Second Turkey-Africa Partnership Summit". November 2014. Archived from the original on 25 December 2016. Retrieved 29 September 2016. ^ "Africa Turkey 2014". November 2014. Archived from the original on 23 December 2015. Retrieved 29 September 2016. ^ "23rd AU summit". June 2014. Archived from the original on 9 July 2014. Retrieved 29 September 2016. ^ "22nd AU summit". January 2014. Archived from the original on 14 February 2015. Retrieved 29 September 2016. ^ "22nd Ordinary Session of the Summit of the African Union". January 2014. Archived from the original on 14 February 2014. Retrieved 29 September 2016. ^ "AU Extraordinary Summit on ICC". October 2013. Archived from the original on 20 December 2013. Retrieved 29 September 2016. ^ "Kenya pushing for African split from International Criminal Court". Irish Times. Retrieved 30 January 2014. ^ "21st AU summit". May 2013. Archived from the original on 1 July 2013. Retrieved 29 September 2016. ^ "20th AU summit". January 2013. Archived from the original on 9 May 2013. Retrieved 29 September 2016. ^ "Global Africa Diaspora Summit". May 2012. Archived from the original on 16 September 2015. Retrieved 29 September 2016. ^ "19th African Union (AU) Summit to be held in Addis Ababa, Ethiopia". June 2012. Retrieved 29 September 2016. ^ "18th AU summit". January 2012. Archived from the original on 14 June 2014. Retrieved 29 September 2016. ^ "17th AU summit". June 2011. Archived from the original on 23 December 2015. Retrieved 29 September 2016. ^ "2nd Africa-India Forum Summit". May 2011. Archived from the original on 31 March 2014. Retrieved 29 September 2016. ^ "16th African Union summit". January 2011. Archived from the original on 4 March 2016. Retrieved 29 September 2016. ^ "15th African Union summit". July 2010. Archived from the original on 9 September 2011. Retrieved 29 September 2016. ^ "14th African Union summit". January 2010. Archived from the original on 11 October 2011. Retrieved 29 September 2016. ^ "13th African Union summit". July 2009. Archived from the original on 2 November 2011. Retrieved 29 September 2016. ^ "12th African Union summit". January 2009. Archived from the original on 2 November 2011. Retrieved 29 September 2016. ^ "The 11th AU summit". July 2008. Archived from the original on 11 October 2011. Retrieved 29 September 2016. ^ "The 10th African Union summit". January 2008. Archived from the original on 2 November 2011. Retrieved 29 September 2016. ^ "9th African Union summit". July 2007. Archived from the original on 2 November 2011. Retrieved 29 September 2016. ^ "8th African Union summit". January 2007. Archived from the original on 6 August 2011. Retrieved 29 September 2016. ^ "7th African Union summit". July 2006. Archived from the original on 6 August 2011. Retrieved 29 September 2016. ^ "6th African Union summit". January 2006. Archived from the original on 14 February 2008. Retrieved 29 September 2016. ^ "5th African Union summit". June 2005. Archived from the original on 24 February 2008. Retrieved 29 September 2016. ^ "AU Summit". Archived from the original on 15 February 2008. Retrieved 29 September 2016. ^ "4th African Union summit". January 2005. Archived from the original on 15 March 2008. Retrieved 29 September 2016. ^ "3rd African Union summit". July 2004. Archived from the original on 7 February 2008. Retrieved 29 September 2016. ^ "African Union Summit Maputo Mozambique". July 2003. Archived from the original on 8 July 2004. Retrieved 29 September 2016. ^ "OAU/AU summit". June 2002. Archived from the original on 22 October 2016. Retrieved 29 September 2016. ^ "1st AU summit: Documents and Speeches". June 2002. Archived from the original on 1 October 2016. Retrieved 29 September 2016. ^ Frugé, Anne (1 July 2016). "The Opposite of Brexit: African Union Launches an All-Africa Passport". The Washington Post. ^ "African Union Slams Trump Muslim Ban, Invoking Legacy of Transatlantic Slave Trade". Democracy Now!. Retrieved 1 February 2017. ^ "Profile: African Union". BBC News. 1 July 2006. Archived from the original on 12 July 2006. Retrieved 10 July 2006. ^ a b c "The World Bank DataBank | Explore. Create. Share". databank.worldbank.org. Retrieved 4 February 2017. ^ Office, Human Development Report. "2015 Human Development Report". report.hdr.undp.org. Retrieved 4 February 2017. ^ "The Fragile States Index 2016 | The Fund for Peace". fsi.fundforpeace.org. Archived from the original on 4 February 2017. Retrieved 12 February 2017. ^ e.V., Transparency International. "Corruption Perceptions Index 2016". www.transparency.org. Retrieved 12 February 2017. ^ "Index of Economic Freedom: Promoting Economic Opportunity and Prosperity by Country". www.heritage.org. Retrieved 12 February 2017. ^ "Vision of Humanity". static.visionofhumanity.org. Archived from the original on 13 February 2017. Retrieved 12 February 2017. ^ "2016 World Press Freedom Index | Reporters Without Borders". RSF. Retrieved 12 February 2017. ^ "Democracy Index 2016" (PDF). Economist Intelligence Unit. Archived from the original (PDF) on 24 February 2017. Retrieved 12 February 2017. ^ "The World Factbook — Central Intelligence Agency". www.cia.gov. Retrieved 4 February 2017. ^ "Fès Festival of World Sacred Music". Lonely Planet. Retrieved 4 September 2018. ^ "Knysna Oyster Festival". Oyster Festival. Retrieved 4 September 2018. ^ Lanyado, Benji. "Malawi's musical turn". The Guardian. Retrieved 4 September 2018. ^ Okanla, Karim. "Benin marks Voodoo Day". BBC News. Retrieved 4 September 2018. ^ "Zulu Reed Dance". Eshowe. Archived from the original on 18 August 2013. Retrieved 4 September 2018. ^ Chiba, Yasuyoshi. "Pictures of the Day: 21 June 2018". The Telegraph. Retrieved 4 September 2018. ^ AIDS Watch Africa: An instrument for promoting AIDS responses in Africa (PDF). Discussion Paper presented by HE President Olusegun Obasanjo to Heads of State of the African Union. July 2004. ^ Dixon, Simon; McDonald, Scott; Roberts, Jennifer (2002). "The Impact Of HIV And AIDS On Africa's Economic Development". BMJ: British Medical Journal. 324 (7331): 232–234. JSTOR 25227281. ^ Barton-Knott, Sophie (3 July 2017). "African Union endorses major new initiatives to end AIDS". UNAIDS. Retrieved 6 August 2017. ^ Buse, Kent (January 2012). "Zeroing in on AIDS and Global Health Post-2015". Globalization and Health. 8: 42–44. ^ "Official quits AU anti-corruption body over 'multiple irregularities'". Radio France Internationale. 23 June 2018. Retrieved 31 January 2019. ^ a b Hove, Mediel (May 2017). "Post-Gaddafi Libya and the African Union: Challenges and the Road to Sustainable Peace". Journal of Asian & African Studies. 52: 271–286. ^ "African Union urges restraint on both sides". The Star. 21 March 2011. Archived from the original on 21 March 2011. Retrieved 5 July 2011. ^ Mulondo, Emmanuel (21 March 2011). "Kutesa, AU blocked from entering Libya". Daily Monitor. Retrieved 21 March 2011. ^ "African Union demands end to military strikes on Libya, skips Paris meeting". Sudan Tribune. 19 March 2011. Archived from the original on 21 March 2011. Retrieved 21 March 2011. ^ Kayawe, Baboki (23 March 2011). "Khama supports no-fly zone on Libya". Mmegi. Retrieved 5 April 2011. ^ "UN authorises no-fly zone over Libya". Al Jazeera. 18 March 2011. Archived from the original on 18 March 2011. Retrieved 18 March 2011. ^ "Rupiah backs action against Libya". The Post. 27 March 2011. Archived from the original on 11 September 2012. Retrieved 5 April 2011. ^ "Arab League Recognizes Libyan Rebel Council". RTTNews. 25 August 2011. Archived from the original on 8 December 2011. Retrieved 25 August 2011. ^ "Tunis recognizes Libyan rebels as country's rep". Seattle Post-Intelligencer. 20 August 2011. Archived from the original on 8 December 2011. Retrieved 20 August 2011. ^ "Egypt recognises Libya rebel government". The New Age. South Africa. 22 August 2011. Archived from the original on 8 March 2012. Retrieved 22 August 2011. ^ Malone, Barry (26 August 2011). "AU won't recognise Libyan rebel council: diplomats". The Daily Star. Retrieved 26 August 2011. ^ "Ethiopia recognizes Libyan rebels". NOW Lebanon. 24 August 2011. Archived from the original on 12 October 2017. Retrieved 24 August 2011. ^ "Libya-NTC: National Transitional Council in Libya". Afrique en ligne. 27 August 2011. Archived from the original on 17 January 2012. Retrieved 27 August 2011. ^ "Chad recognises rebel council as only legitimate authority in neighbouring Libya". Al Jazeera. 24 August 2011. Retrieved 24 August 2011. ^ "Benin recognize Libyan rebels". Reuters. 27 August 2011. Retrieved 27 August 2011. ^ "Algeria declines to recognize Libyan rebels". NOW Lebanon. 26 August 2011. Archived from the original on 4 June 2012. Retrieved 26 August 2011. ^ "Libyan envoy to Zimbabwe expelled for burning flag". The Zimbabwean. 26 August 2011. Archived from the original on 26 August 2011. Retrieved 26 August 2011. ^ "Libya: How SA stood firm on money for rebels". Mail & Globe Online. 26 August 2011. Retrieved 27 August 2011. ^ "African Union officially recognises Libya's new leadership". Archived from the original on 20 November 2011. ^ "AU denounces Togo 'military coup'". BBC News. 6 February 2005. Retrieved 10 July 2006. ^ "All is rather easily forgiven". The Economist. 23 July 2009. Retrieved 15 July 2011. ^ "African Union lifts sanctions on Mauritania". Reuters. 1 July 2009. Retrieved 3 December 2017. ^ Dixon, Robyn; Labous, Jane. "Gains of Mali's Tuareg rebels appear permanent, analysts say". Los Angeles Times. Retrieved 4 September 2018. ^ a b Bernadette Schulz, Ruth Langer, "Peace missions – The long haul", D+C, 27 August 2013. ^ Besancon, Marie; Dalzell, Stephen (June 2014). "The Soldier and the Street: East African CIMIC in Somalia and Beyond". PRISM Security Studies Journal. 5: 117–135. ^ Article 3(f) of the Constitutive Act. ^ Article 4(e) of the Constitutive Act. ^ "AU Darfur mission 'to end soon'". BBC News. 28 June 2006. Retrieved 23 April 2010. ^ "Security Council Authorises Deployment of United Nations-African Union 'Hybrid' Peace Operation in Bid To Resolve Darfur Conflict". United Nations. Archived from the original on 15 August 2007. Retrieved 26 November 2012. ^ "African move on Bashir dismissed". BBC News. 5 July 2009. Retrieved 23 April 2010. ^ Sulaiman, Abubkar o.; Agoha, Ifeanyi Chuckwu (1 October 2013). "South Sudan Negotiated Independence: A Critique of African Union's Role". European Journal of Sustainable Development. 2 (3): 145–154. doi:10.14207/ejsd.2013.v2n3p145. Archived from the original on 23 February 2014. Retrieved 8 March 2014. ^ a b Anderson, Noel (2014). "Peacekeepers Fighting a Counterinsurgency Campaign: A Net Assessment of the African Union Mission in Somalia". Studies in Conflict and Terrorism. 37: 936–954. ^ Reynolds, Paul (8 July 2002). "African Union replaces dictators' club". BBC News. Archived from the original on 1 June 2010. Retrieved 23 April 2010. ^ Afro News Eritrea breaks with African Union, 20 November 2009. ^ "Eritrea: Nation Appoints AU Envoy in Ethiopia". 20 January 2011. Retrieved 9 May 2011. ^ a b "African Union forces seek rebel leader". France 24. Archived from the original on 15 April 2008. Retrieved 4 September 2018. ^ "Comoros anger over chopper crash". BBC News. Retrieved 4 September 2018. ^ "Battles on Comoros rebel island". BBC News. Retrieved 4 September 2018. ^ "Comoran rebel seeks French asylum". BBC News. Retrieved 4 September 2018. ^ "Comoran rebel asylum plea refused". BBC News. Retrieved 4 September 2018. ^ "Toybou confirmed Anjouan president". Afrol News. Retrieved 4 September 2018. Strengthening Popular Participation in the African Union: A Guide to AU Structures and Processes, AfriMAP and Oxfam GB, 2010. Towards a People Driven African Union: Current Challenges and New Opportunities AfriMAP, AFRODAD and Oxfam GB, January 2007. The New African Initiative and the African Union: A Preliminary Assessment and Documentation by Henning Melber, Publisher: Nordiska Afrikainstitutet, Sweden; ISBN 91-7106-486-9; (October 2002). "The African Union, NEPAD and Human Rights: The Missing Agenda" Human Rights Quarterly Vol.26, No.4, November 2004. Bibliography on the AU at the Peace Palace Library. 1.2 billion people as of 2016, it accounts for about 16% of the world's human population. The continent is surrounded by the Mediterranean Sea to the north, the Isthmus of Suez and the Red Sea to the northeast, the Indian Ocean to the southeast and the Atlantic Ocean to the west. The continent includes Madagascar and various archipelagos. It contains 54 fully recognised sovereign states (countries), nine territories and two de facto independent states with limited or no recognition. The majority of the continent and its countries are in the Northern Hemisphere, with a substantial portion and number of countries in the Southern Hemisphere. Africa's average population is the youngest amongst all the continents; the median age in 2012 was 19.7, when the worldwide median age was 30.4. Algeria is Africa's largest country by area, and Nigeria is its largest by population. Africa, particularly central Eastern Africa, is widely accepted as the place of origin of humans and the Hominidae clade (great apes), as evidenced by the discovery of the earliest hominids and their ancestors as well as later ones that have been dated to around 7 million years ago, including Sahelanthropus tchadensis, Australopithecus africanus, A. afarensis, Homo erectus, H. habilis and H. ergaster—the earliest Homo sapiens (modern human), found in Ethiopia, date to circa 200,000 years ago. Africa straddles the equator and encompasses numerous climate areas; it is the only continent to stretch from the northern temperate to southern temperate zones.Africa hosts a large diversity of ethnicities, cultures and languages. In the late 19th century, European countries colonised almost all of Africa; most present states in Africa originated from a process of decolonisation in the 20th century. African nations cooperate through the establishment of the African Union, which is headquartered in Addis Ababa. The Commission meets twice a year: usually in March or April and in October or November. One of these meetings is usually in Banjul, where the Commission's secretariat is located; the other may be in any African state. All of the competing nations are from the African continent. The first Games were held in 1965 in Brazzaville, Congo. The International Olympic Committee granted official recognition as a continental multi-sport event, along with the Asian Games and Pan American Games. Since 1999, the Games have also included athletes with a disability.The Supreme Council for Sport in Africa (SCSA) was the organisation body for the game. On 26 July 2013, the Extraordinary Assembly of the Supreme Council for Sports held in Abidjan, Ivory Coast that was held on the sidelines of the 5th Session of the African Union Conference of Sports Ministers that started on 22 July 2013 recommended the dissolution of the Supreme Council for Sport in Africa and to also transfer all functions, assets & liabilities of SCSA to the African Union Commission. The organization of the African Games is now managed by three parts, the AU (the owners of the game), the ANOCA (occupying the technical aspects) and the AASC (developing marketing policy, sponsorship and research resources). The Commission of the African Union acts as the executive/administrative branch or secretariat of the AU (and is somewhat analogous to the European Commission). It consists of a number of Commissioners dealing with different areas of policy. The Commission is headquartered in Addis Ababa, Ethiopia. It should be distinguished from the African Commission on Human and Peoples' Rights, (based in Banjul, Gambia), which is a separate body that reports to the African Union. The African Union Mission in Sudan (AMIS) was an African Union (AU) peacekeeping force operating primarily in the country's western region of Darfur with the aim of performing peacekeeping operations related to the Darfur conflict. It was founded in 2004, with a force of 150 troops. By mid-2005, its numbers were increased to about 7,000. Under United Nations Security Council Resolution 1564, AMIS was to "closely and continuously liaise and coordinate ... at all levels" its work with the United Nations Mission in Sudan (UNMIS). AMIS was the only external military force in Sudan's Darfur region until UNAMID was established. It was not able to effectively contain the violence in Darfur. A more sizable, better equipped UN peacekeeping force was originally proposed for September 2006, but due to Sudanese government opposition, it was not implemented at that time. AMIS' mandate was extended repeatedly throughout 2006, while the situation in Darfur continued to escalate, until AMIS was replaced by UNAMID on December 31, 2007. The African Union Mission in Somalia (AMISOM) is an active, regional peacekeeping mission operated by the African Union with the approval of the United Nations Security Council. It is mandated to support transitional governmental structures, implement a national security plan, train the Somali security forces, and to assist in creating a secure environment for the delivery of humanitarian aid. As part of its duties, AMISOM also supports the Federal Government of Somalia's forces in their battle against Al-Shabaab militants. AMISOM was created by the African Union's Peace and Security Council on 19 January 2007 with an initial six-month mandate. On 21 February 2007 the United Nations Security Council approved the mission's mandate. Subsequent six-monthly renewals of AMISOM's mandate by the African Union Peace and Security Council have also been authorised by the United Nations Security Council.The duration of AMISOM's mandate has been extended in each period that it has been up for review, lastly in July 2018. The current mandate expires on 31 May 2019, with an interim goal to reduce troop levels to a maximum of 20,626 by 28 February 2019. The African Union Passport is a common passport document that is set to replace existing nationally-issued African Union member state passports and exempt bearers from having to obtain any visas for all 55 states in Africa. It was launched on July 17th, 2016 at the 27th Ordinary Session of the African Union that was held in Kigali in Rwanda by Rwandan President Paul Kagame and Chadian President Idriss Déby. As of June 2018, the passport was planned to be rolled out and ready for use at borders worldwide by 2020. The Chairperson of the African Union is the ceremonial head of the African Union elected by the Assembly of Heads of State and Government for a one-year term. It rotates among the continent's five regions. A candidate must be supported by at least two-thirds of the member states or by consensus. The chairperson is expected to complete the term without interruption; hence eligible countries with impending elections may be ineligible. The Chairperson of the African Union Commission is the head of the African Union Commission. On January 30, 2017, it was announced that Chad's Moussa Faki would become the further Chairperson. The Court of Justice of the African Union was originally intended to be the "principal judicial organ" of the African Union (Protocol of the Court of Justice of the African Union, Article 2.2) with authority to rule on disputes over interpretation of AU treaties. The Court has, however, never come into existence because the African Union has decided that it should be merged with the African Court on Human and Peoples' Rights to form a new court: the African Court of Justice and Human Rights (ACJHR). Underlying this decision was the concern at the growing number of AU institutions, which the AU could not afford to support.A protocol to set up the Court of Justice was adopted in 2003, and entered into force in 2009. It was, however, superseded by a protocol creating the African Court of Justice and Human Rights. The merger protocol was adopted during the 11th African Union Summit in July 2008. The united court will be based in Arusha, Tanzania. 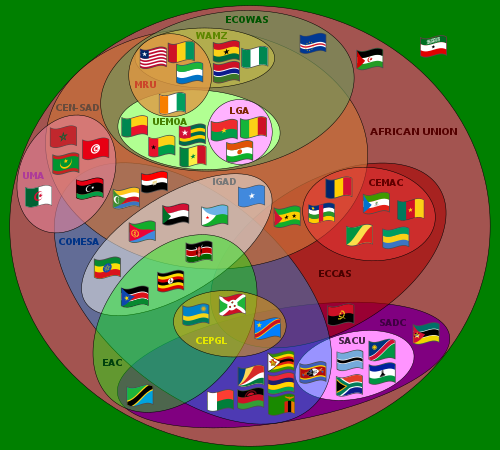 The East African Community (EAC) is an intergovernmental organization composed of six countries in the African Great Lakes region in eastern Africa: Burundi, Kenya, Rwanda, South Sudan, Tanzania, and Uganda. Paul Kagame, the president of Rwanda, is the EAC's chairman. The organisation was founded in 1967, collapsed in 1977, and was revived on 7 July 2000. In 2008, after negotiations with the Southern African Development Community (SADC) and the Common Market for Eastern and Southern Africa (COMESA), the EAC agreed to an expanded free trade area including the member states of all three organizations. The EAC is an integral part of the African Economic Community. The EAC is a potential precursor to the establishment of the East African Federation, a proposed federation of its members into a single sovereign state. In 2010, the EAC launched its own common market for goods, labour, and capital within the region, with the goal of creating a common currency and eventually a full political federation. In 2013, a protocol was signed outlining their plans for launching a monetary union within 10 years. In September 2018 a committee was formed to begin the process of drafting a regional constitution. When the African Union (AU) was founded in 2002, it represented almost the entire African continent. As the successor to the Organisation of African Unity (OAU), founded in 1963, its membership was inherited from that body. Currently, the AU has 55 member states. Growth in the OAU typically came from post-colonial independence; as decolonization ended, the borders of the OAU had overlapped almost all of Africa. The individual member states of the African Union (AU) coordinate foreign policy through this agency, in addition to conducting their own international relations on a state-by-state basis. The AU represents the interests of African peoples at large in intergovernmental organizations (IGO's); for instance, it is a permanent observer at the United Nations' General Assembly. The Intergovernmental Authority on Development (IGAD) is an eight-country trade bloc in Africa. It includes governments from the Horn of Africa, Nile Valley and the African Great Lakes. Its headquarters are in Djibouti City. The member states of the African Union are the 55 sovereign states that have ratified or acceded to the Constitutive Act of the African Union to become member states to the African Union (AU). The AU was the successor to the Organisation of African Unity (OAU), and AU membership was open to all OAU member states. From an original membership of 36 states when the OAU was established on 25 May 1963, there have been nineteen successive enlargements – the largest occurring on 18 July 1975 when four states joined. Morocco is the newest member state, having joined in January 2017. Morocco was a founder member of the OAU but withdrew in 1984 following the organization's acceptance of the Sahrawi Arab Democratic Republic as a member state. Morocco rules over most of the territory, but sovereignty is disputed. As of 2017, the AU spans the entirety of the African continent, with the exception of Ceuta, Melilla, and the plazas de soberanía. Also excluded are offshore islands that are integral parts of the transcontinental countries of France, Portugal, Spain and Yemen. The 55 member states are grouped into five regions. The African Union is composed of fifty-two republics and three monarchies. The total population of the AU is 1,068,444,000 (2013). The Union of South Africa (Dutch: Unie van Zuid-Afrika, Afrikaans: Unie van Suid-Afrika pronunciation ) is the historical predecessor to the present-day Republic of South Africa. It came into being on 31 May 1910 with the unification of the Cape Colony, the Natal Colony, the Transvaal, and the Orange River Colony. It included the territories that were formerly a part of the South African Republic and the Orange Free State. Following the First World War, the Union of South Africa was granted the administration of South West Africa (now known as Namibia) as a League of Nations mandate. It became treated in most respects as another province of the Union, but it never was formally annexed. Like Canada and Australia, the Union of South Africa was a self-governing autonomous dominion of the British Empire. Its independence from the United Kingdom was confirmed in the Balfour Declaration 1926 and the Statute of Westminster 1931. It was governed under a form of constitutional monarchy, with the Crown being represented by a governor-general. The Union came to an end with the enactment of the constitution of 1961, by which it became a republic and temporarily left the Commonwealth. The African Union-United Nations Hybrid Operation in Darfur (known by its acronym UNAMID) is a joint African Union (AU) and United Nations (UN) peacekeeping mission formally approved by United Nations Security Council Resolution 1769 on 31 July 2007, to bring stability to the war-torn Darfur region of Sudan while peace talks on a final settlement continue.Its initial 12-month mandate was extended to 31 July 2010. As of 2008, its budget was approximately US $106 million per month. Its force of about 26,000 personnel began to deploy to the region in October 2007. The 9,000-strong African Union Mission in Sudan (AMIS), which was previously responsible for peacekeeping, had completely merged into this new force by 31 December 2007.The mandate is for a force of up to 19,555 military personnel and 3,772 police, along with a further "19 formed police units comprising up to 140 personnel each." The peacekeepers are allowed to use force to protect civilians and humanitarian operations. UNAMID is the first joint UN/AU force and the largest peacekeeping mission. As of December 2008, it had deployed 15,136 total uniformed personnel, including 12,194 troops, 175 military observers, and 2,767 police officers, who were supported by 786 international civilian personnel, 1,405 local civilian staff, and 266 UN volunteers. The United States of Africa is a proposed concept for a federation of some or all of the 55 sovereign states on the continent of Africa. The concept takes its origin from Marcus Garvey's 1924 poem "Hail, United States of Africa".